SWMCA Brands & Holding LLC. After 30 years, we are retiring the Fun Euro name. The first Fun Euro font was drawn in 1986. Don't worry, this and other fonts will still be offered, and for free, just under a different name The new name for this font is Name Day Cheers. It's still part of the Russelfeiring Blast font family officially. 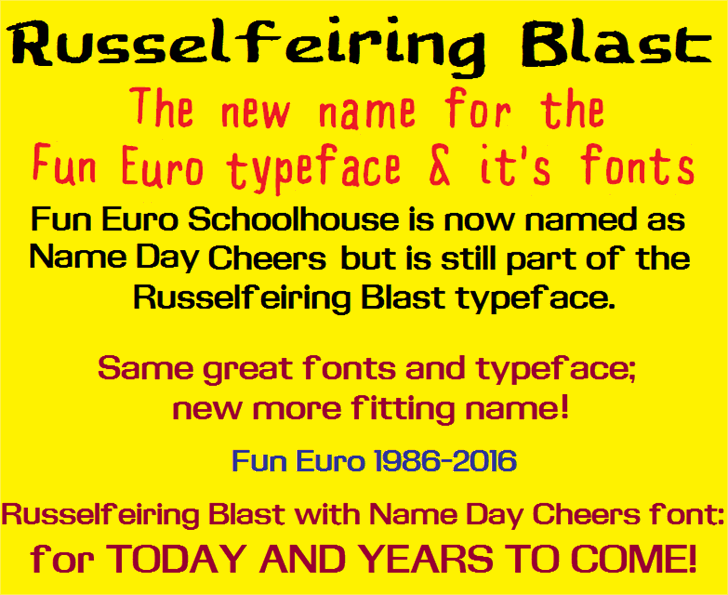 Because Russelfeiring is a adult activity and hard for kids to pronounce anyway, we decided to call this font Name Day Cheers (the kiddo equivalent of Russelfeiring). Only that holiday is worldwide. On the specimens with the old Fun Euro Schoolhouse which the name is still appearing, we will eventually edit out the Fun Euro Schoolhouse name and replace it with the new Name Day Cheers name, or replace them altogether. 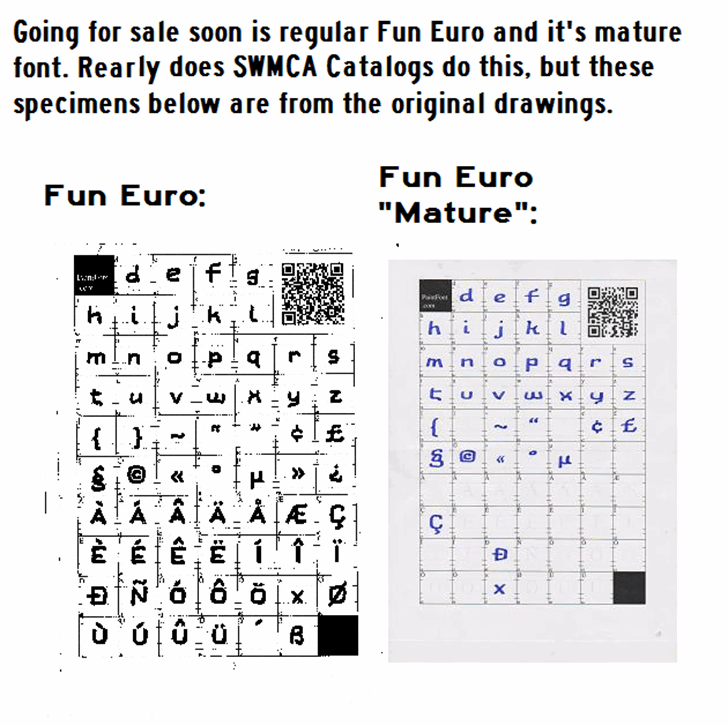 This is the SWMCA Schoolhouse version of Fun Euro. It's a pretty playful font. Fun Euro is a more cartoonish play off of Eurostyle. never before seen or used Fun Euro Schoolhouse font. The low-cost full font is coming soon. It looks nothing like Eurostile, but it's still a decent level-2 heading font. Actually it was based on Eurostile. Like Eurostile Candy has a more rounded look, it too was based on Eurostile but has a different look. Some of the angles in Fun Euro were changed like on the "o" characters. The "l" was changed to conform more to a modern style used today in fonts such. The "G" retained the same style but the vertical part was angled at about 25 degrees. The "R" had to be redesigned because it resembled the "A" in the alternate characters. The "P" was redesigned at the top to match it more. Some of the end angles like on the bottom of the "g" were reversed to point in the opposite direction. The "K" had to be changed too so it didn't look too much like a "H" as the "D" was changed so it didn't look too much like a "O". That was no problem when on computer screens, but presented huge problem when tested with various printers. Epson Stylus CX6600, Canon Pixma MP280, and and a Hewett-Packard were all used with similar results. Very important especially for the "Schoolhouse version" where it might actually appear in 2nd grade textbooks. Some of the horizontal lines such as in the "h", "n", and "u" were just angled to give it a more unique feel. This is an altered version designed for grammar schools so certain characters are varied even from the regular Fun Euro. It looks more like Eurostile in the caps. Basically Fun Euro had "the Cheltenham problem." The one we know today is far from the 1896 version drawn by Bertram Goodhue. 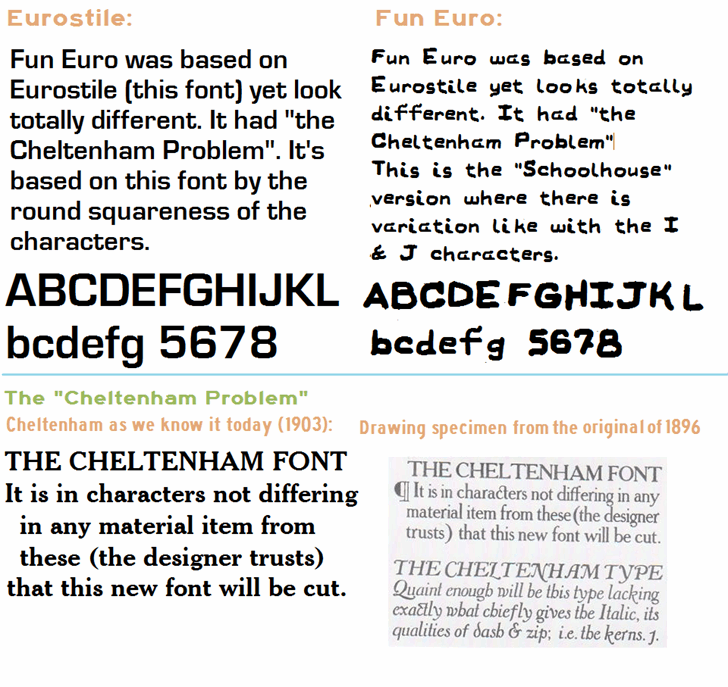 The Cheltenham we see today is actually the 1903 version from Morris Fuller Benton of American Type Founders. The New York Times have their own version appropriately dubbed "Times Cheltenham". There is a Fun Euro Mature that does like a little closer to Eurostile. A Crayola marker (not a crayon) was used as the medium for making Fun Euro while a Sharpie Calligraphic pen was used for Fun Euro Mature version. 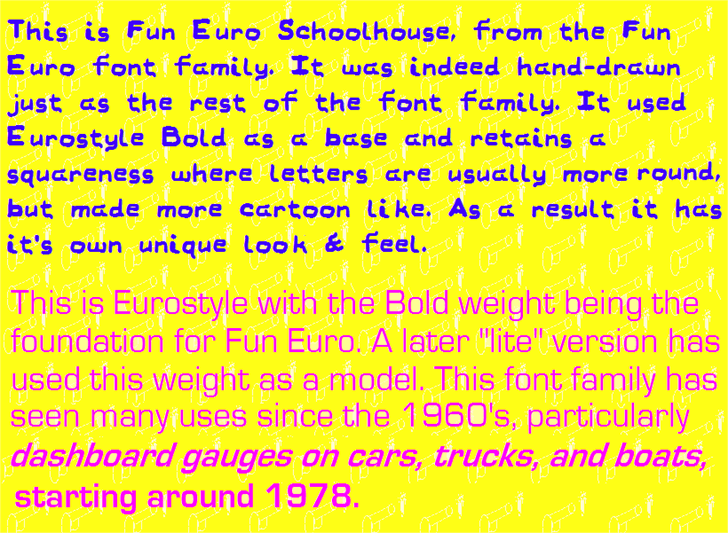 Fun Euro got the "Schoolhouse" font while Fun Euro Mature got a cursive font in addition to the manuscript one.